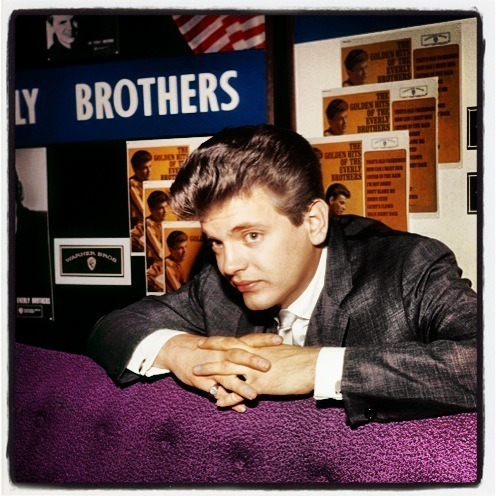 American Wolf: Last Thoughts On Phil Everly, 1939-2014. Only three days into 2014, rock and roll has already suffered its first major casualty: Phil Everly, one half of the legendary pioneering rock duo, The Everly Brothers. One of the ways that you can tell of The Everly Brothers' massive influence on rock and roll is how they pop up in the most unlikely of places. Don't get me wrong, they pop up in the most likely of places, too—in the Rock & Roll Hall Of Fame (one of the first 10 inductees in 1986, alongside Elvis Presley and Chuck Berry, among others), on Rolling Stone's 100 Greatest Artists list (at #33, beating out the likes of icons such as Michael Jackson, Madonna, and David Bowie), in the 1,001 Albums You Must Hear Before You Die (1961's A Date With The Everly Brothers, the Warner Brothers debut LP that had their (third) #1 hit "Cathy's Clown" on it), and pretty much any essential rock song or album list that's worth a damn—but it's the unlikely places that seal their legend. Ray Charles kicking off his massively-influential Modern Sounds In Country & Western with a cover of "Bye Bye Love" in the early 1960s; Elvis Presley crooning "Let It Be Me" in his initial Vegas comeback shows in the early 1970s; Nick Lowe and Dave Edmunds cutting an EP of four Everly Brothers songs as a sidebar to their legendary new wave band Rockpile in the early 1980s; Elliott Smith name-checking "Cathy's Clown" in the opening lines of his devastating "Waltz #2 (XO)" in the late 1990s; Robert Plant and Alison Krauss covering "Gone, Gone, Gone" as the lead single to their Grammy-winning hit Raising Sand in the late 2000s; and finally, Green Day's Billie Joe Armstrong and Norah Jones recording a song-for-song "cover album" of The Everly Brothers' 1958 LP, Songs Our Daddy Taught Us, late last year. At the core of The Everly Brothers' appeal was their signature "high and lonesome" harmonies that were straight from country music. Don sang the main lower melody parts, Phil the trickier high countermelodies. If they did nothing else but set the par for all rock harmonizing to come (which they did), this would be reason enough to enshrine them in rock's canon. Just listen to John Lennon and Paul McCartney, whose co-vocal sound on their early Beatlemania hits like "She Loves You," "I Want To Hold Your Hand," and "Please Please Me" takes the Everlys' sound and places it in a contemporary British sound (and indeed, The Beatles once referred to themselves as "The English Everly Brothers" in an early interview). Even in their later years, the influence remained, as they broke off from recording the late-period close-harmony original "Two Of Us" into an impromptu cover "Bye Bye Love." The Everly Brothers planted the seed for all great rock harmony groups and singing, from The Beach Boys (who covered "Devoted To You" on their Party! album in 1965) and The Byrds (who directly noted the Everlys' influence as they were making their first country records in 1968) on down. And it wasn't just harmony groups. Bob Dylan once said of the Everlys: "We owe these guys everything. They started it all." Part of Dylan's praise may come from the fact that, more than many of their contemporaries, the Everlys were consistent hit-makers. In their key 1957-1961 period, they enjoyed three #1 hits (1957's "Wake Up Little Susie", 1958's "All I Have To Do Is Dream," and 1960's "Cathy's Clown"), two #2 hits (1957's "Bye Bye Love" and 1958's "Problems"), and one #3 hit (1958's "Bird Dog"), among many other Top 10 and Top 40 hits; most of these aforementioned hits also made the top spot on the country music charts as well. Compared to a chart-monster like Elvis Presley, this is chickenfeed, but compared to most of their other contemporaries, this is quite impressive—consider Jerry Lee Lewis, Little Richard, and Buddy Holly, each of whom only had three Top 10 hits total in this period, let alone three number ones—and speaks to their key influence and hit sound. For although The Everly Brothers were steeped in country, it was in a decidedly rock and roll package, as masterminded by the densely-layered productions in songs like "Bye Bye Love" and "Wake Up Little Susie" that were largely masterminded by Chet Atkins. What sounded like little two- and three-chord rockabilly stompers were in fact a forceful punch of rhythm and beat that were almost impossible to copy. Which isn't to say that no one tried to. In 1957, a meek duo from New York City copped the Everlys' sound and style, calling themselves Tom & Jerry and scored a minor #49 hit with the "Bye Bye Love" knockoff "Hey Schoolgirl." It was enough to get them on American Bandstand the following year (right after Jerry Lee Lewis played "Great Balls Of Fire"), and provide a taste of success. You know, the Everlys have a long history of knocking each other down, as brothers can do. So in a certain sense, it was hilarious that the four of us were doing this tour, given our collective histories of squabbling. And it's amazing, because they hadn't seen each other in about three years. They met in the parking lot before the first gig. They unpacked their guitars—those famous black guitars—and they opened their mouths and started to sing. And after all those years, it was still that sound I fell in love with as a kid. It was still perfect. Simon is referring to The Everly Brothers' feature sets in his 2003 reunion tour with Garfunkel, in which he provided a way for his idols to "take a bow" after quietly retiring in 2000. It would be their final bow. Phil's widow told the Washington Post that his older brother Don Everly was too upset to talk: "He always expected he'd go first." With Phil's death just weeks before what would have been his 75th birthday, rock's most influential duo has been silenced forever. Thanks for this very good article on Phil. The Everly Brothers harmonies were absolutely unique. A quest of eternity. Kind of an attemp to reconcile the yin and the yang of America. Bye Bye Love is so lively and effervescent for such a dark song that it could have been sung by a Black choir. Please go down under section "Nouvelles, etc." of my website, for an article written by me (in a very passable English) on Don and Phil in a miserable hotel of Montreal corn-field outskirts in 1966.